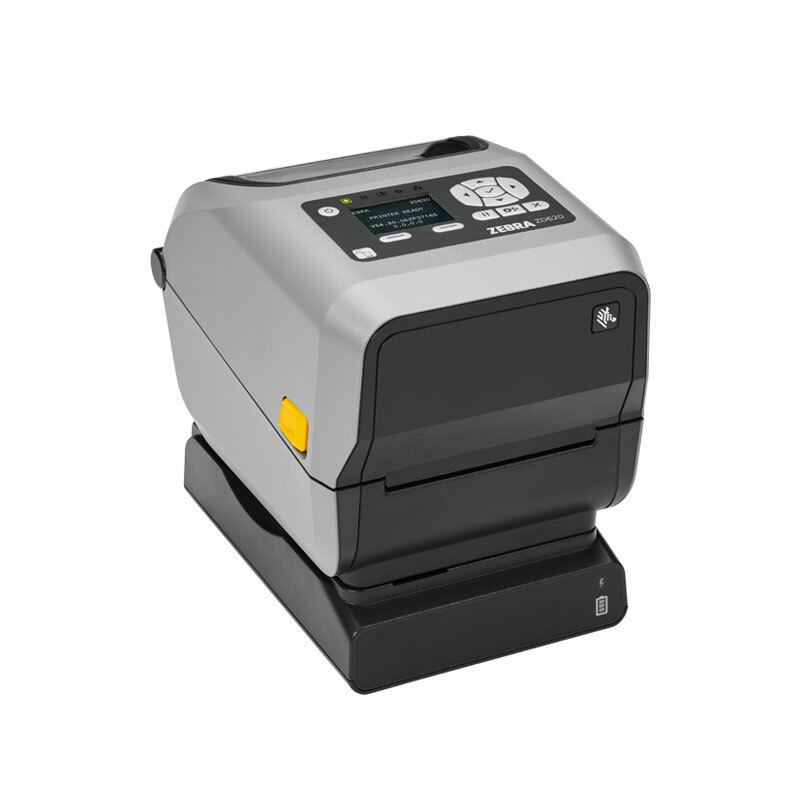 The Zebra ZD620 is a new high-performance desktop label printer series. It offers maximum flexibility with multiple feature options that can either be factory-installed or upgraded later on. The compact and robust devices provide a high print resolution, high printing speeds as well as uncomplicated integration and operation. 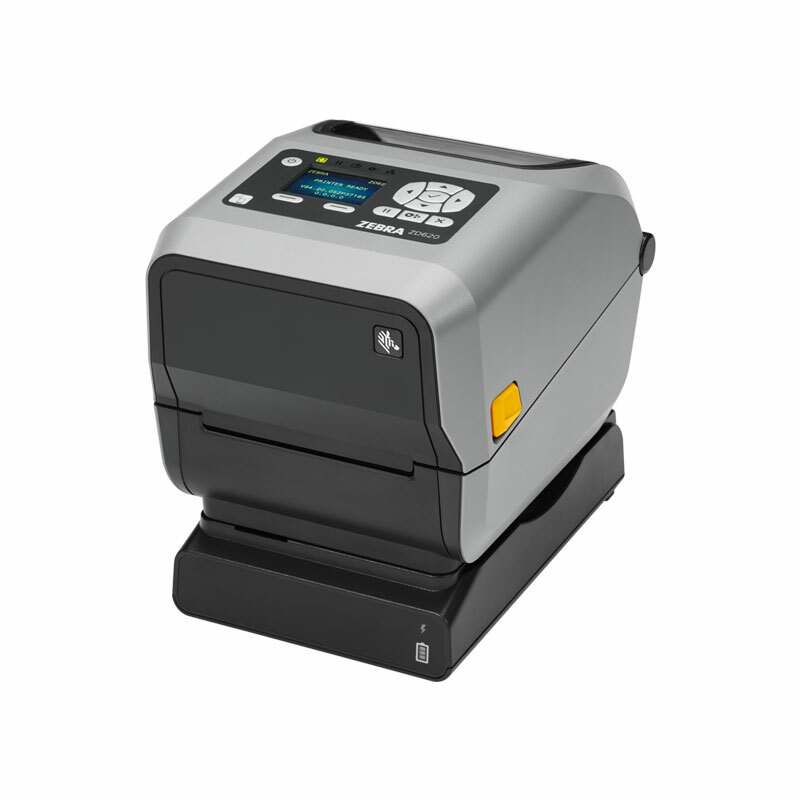 The brand-new optional power base enables comfortable mobile use of the label printers. The ZD620 desktop printers, with a maximum print width of 108 mm, are suitable for a wide spectrum of applications, for example in retail or production environments. There is also a healthcare version available. 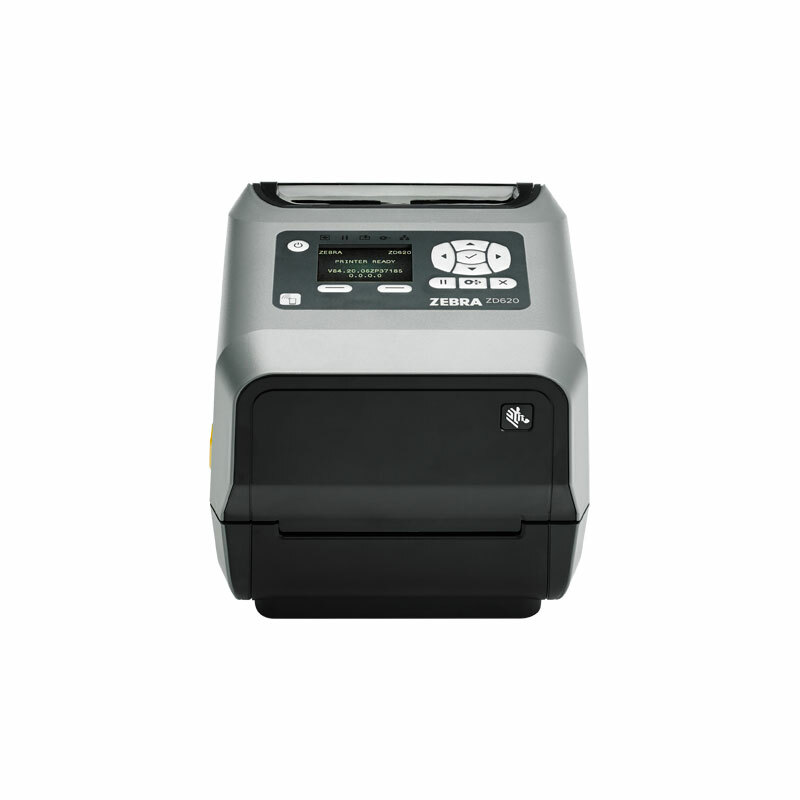 Due o their extraordinary adaptability, the Zebra ZD620 series desktop label printers are the ideal equipment for all sorts of applications. The printers are available as direct thermal (ZD620d) or thermal transfer (ZD620t) versions and can be selected according to use. Maximum print speeds of 203 mm/second (203 dpi model) or 152 mm/second (300 dpi model) guarantee high throughput and smooth working procedures. The printers are equipped with a media dancer which ensures consistent tension on the media roll for optimal printing quality regardless of printing speeds. The 203 dpi model can be upgraded to 300 dpi later with an accessory kit and it can be changed back again according to requirements, providing users with ultimate flexibility. The Zebra ZD620 series printers include the LinkOS printer operating system and Zebra’s Print DNA software suite – powerful enterprise tools for optimal results. Print DNA comprises development tools for fast and easy setup and integration. It includes applications for remote management of the devices and MDM connectors for seamless incorporation into AirWatch or SOTI MobiControl frameworks. Zebra’s Print DNA also ensures that the printers can be utilized to their full potential and it enables constant monitoring of device health and performance. The label printers support ZPL and EPL printer languages. Their robust, double-wall construction makes the Zebra ZD620 series printers a perfect choice for different environments. 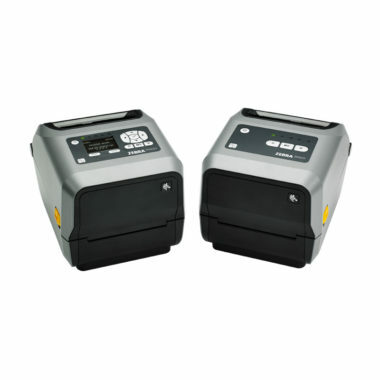 They come with multiple connectivity capabilities: Ethernet 10/100, RS-232 serial, USB 2.0, USB Host and Bluetooth Low Energy. WiFi 802.11ac is available as an option together with Bluetooth 4.1. The smart desktop printers come with a 3-button user interface and 5 LED status icons as a standard or with a 10-button keypad and a color LCD as option. The display color changes in case of an occurring error or if the printer is paused, which enables status check at a glance and simplifies operation. The integrated movable sensor allows a flexible choice of media. Thanks to the “OpenACCESS” construction, the printers of the ZD620 series enable easy media loading. It is possible to use high capacity ribbons of 300 m which saves costs and reduces downtime for ribbon changes. The printers also support linerless media. The Zebra ZD620 series printers were designed with the user in mind and can be tailored to individual needs. A new feature is the power base with battery pack that can be attached to the printer to enable a mobile use of the device. Also available are a dispenser and a cutter, either factory installed or with an accessory kit for on-site installation. Top-quality label printing with the Zebra ZD620 desktop printers: best printing performance, exceedingly flexible use and simple operation for an optimal workflow.